Now this is a rec center! Credit: The Ohio State University/Office of Student Life/Department of Recreational Sports. As part of Fit Bottomed College Week, we’re highlighting a few of the coolest college rec and fitness centers across the country! The facilities are spread out over the campus, so you don’t have to haul your stuff from one side of campus to the other. I like that part. 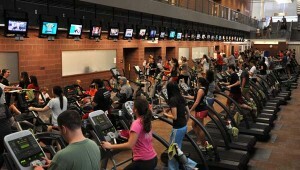 No sense in trying to discourage college students by making it harder to get to their workout. The flagship facility though is definitely the Recreation & Physical Activity Center (RPAC), which is their largest (shown above) with more than 630,000 square feet. OMG that is enormous! I can’t imagine something that large. 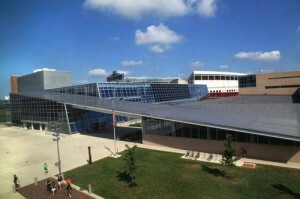 The RPAC is at the center of campus and houses much of the welcome center, additional workout spaces and a cool skywalk from the fitness center to the Physical Activity and Education Services academic building. How cool is that? There’s nothing like gettin’ in a workout and then heading right to class. Aside from that mother of a fitness center, the Outdoor Adventure Center (OAC) is dedicated mostly to all things outdoors. They have rock climbing walls, equipment storage for kayaks and canoes, and they also have several turf fields where people can play soccer, flag football, rugby and so much more. Really? If I only had this in college, I might as well have spent most of my years outside—except for the extremely windy and cold conditions—but you get the point. So if none of those facilities appeals to you, there’s the Jesse Owens Recreation Centers. There is a North, South and West Center on campus, which is, according the website, a short walk for nearly 12,000 students. There’s that convenience factor I was talking about. The West facility is strictly used for tennis, but the other two are additional places for students and faculty to use. The North and South facilities house equipment like tumbling mats, table tennis tables and loads of cardio machines, like exercise bikes and ellipticals. Again, how could you not get out of your dorm room and go use these places? I think if I had access to all this in college, I would have dragged a few friends out more to go work out. With all those facilities, it’s obvious what sets The Ohio State apart. Right? 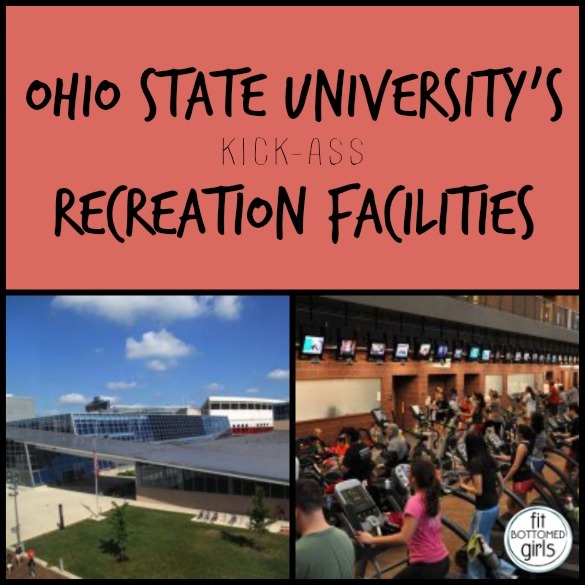 And even though The Ohio State has these rad workout facilities, according to Howard, they can also boast sharing the title of oldest recreational sports department in the country, as it was founded in 1913. She says they share the title with the University of Michigan, and if anyone knows anything about college sports, that is one heck of a rivalry. Goodness, I would not want to get in the middle of an argument with those guys.